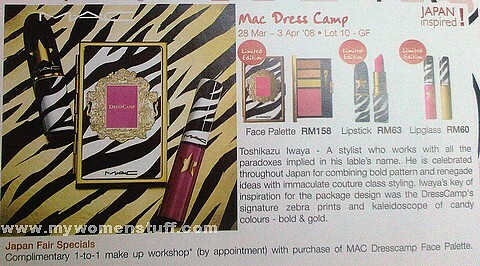 I was out today at Isetan in Lot 10 when I remembered that the MAC Dress Camp collection had launched. My main intention was to check out the Dress Camp face palette. The face palette comes with a blush (Dress Camp Pink) and 3 eyeshadows and a brush in a palette that looks pretty much like what you see in the picture. As I expected, it looks quite tacky in terms of packaging. But how does the product measure? Dress Camp Pink blush is very bright in the pan. I swiped it to test and it went on very pigmented. You would be advised to use a light hand with this one. The pink is a warmed pink which I was quite surprised as I thought it looked cool. I think it would look nice on, with a light hand. The 3 eyeshadows, Sunny Girl, Trend and Golden Girl are surprisingly sheer. Sunny girl showed up sheer gold on my arm whilst I couldn’t get Trend to show up at all! I kept rubbing away at the tester but nope. Nothing. Golden Girl was also a sheer deeper gold. Definitely nothing as pigmented as what you see in the picture. So, all in all, I’d say that you are getting a pretty wearable palette although it looks garish. The Dress Camp lipstick (Too Fab) is a bright fuschia. I found it too bright to be worn together with the face palette. However, the sales assistant assured me that it was nicely toned down with the use of the lipglasses She-Gold (gold with glitter) and Fashion (bright pink). As I don’t use MAC cosmetics at all anymore, I have nothing to compare the textures or finish with. The blush would be lovely if sold separately. As a palette, its too bright for those with light skintone (but the eyeshadows would work well) and it would be nice on those with darker skintone (but the eyeshadows will fail miserably) so its just too complicated for me to get my head around! I however, had a very pleasant browsing experience at the MAC Counter in Lot 10 (located in Isetan). I was attended to by Baby (a guy) and he was friendly and helpful. Through him too, I found out that Heatherette (MAC’s upcoming collection) is due in Malaysia at the end of April or early May 2008 and Baby assures me that that eyeshadow palette is worth waiting for, so look out for that one! … and I’m not impressed. This was the Bobbi Brown Pink Satin collection that caught my attention. The eyeshadows looked promising and even the lip palette looked useful although I don’t usually go for lip products in a palette. I tested the eyeshadow palette at the Bobbi Brown counter and immediately knew I wouldn’t like it. Firstly the texture of the eyeshadows felt hard. The Navajo Metallic Eye Shadow (light white shade) took some digging into before it showed up on my hand as sheer white shimmer. Pink Ice Metallic Eye Shadow was not much better. It shows up a sheer shimmer with a hint of pink. 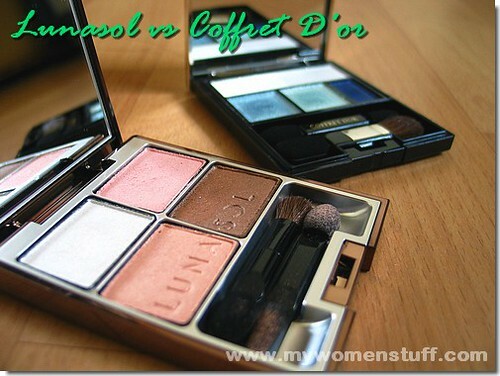 The best color of the lot was Hot Stone Metallic Eye Shadow. Its a lovely shimmery medium toned grey and nothing as pale as what you see in the picture. If it was sold as a single, I’d seriously consider getting it. The lip colors were quite messy looking so I didn’t want to try them. The colours are darker than what you see in the picture above but I’m told by a friend that they go on very nice and smooth. I’d take her word for it! The set of brushes are mini sized but have a full sized head. That makes it good for travelling and having short handles makes it easy to handle. However, if you already own a set of Bobbi’s brushes it wouldn’t be much point to get another right? The case is quite thick because it fits the brushes and 2 palettes into it but as its quite compact, I have no comments on that. The whole set is retailing for RM450 and they are not sold separately. Jojoba did a review on this collection too and she was offered an “under the counter” purchase of one item if she paid cash. The girls at the BB counter I went to (Midvalley Megamall) did not make me that offer. And I was assured (three times) that the price was RM450 but the price quoted to Jojoba was RM425. Strange! If you already have a makeup collection, I’d say skip this one because its really nothing very special. If you are new to makeup, then yes, its worth checking out to see if you like it because for RM450 for a whole set eyes and lip colors and brushes its a pretty good deal! For me, its money saved. Bring on the next collection!